I USED CRESCENT ROLLS INSTEAD OF COOKIES. LAY OUT THE CRESCENT ROLLS, AND ROLL THEM OUT WITH A ROLLING PIN, TO FORM THE CRUST! I USED KIWI, STRAWBERRIES, GRAPES, AND BLUEBERRIES. Halved grapes, sliced bananas, blueberries, pineapple tidbits, orange sections and a red cherry. Mix butter, sugar, eggs, flour, salt, baking soda, sour cream, and grated lemon rind, into a dough, and divide mixture in half. Press each half into a 12-inch pizza pan. Bake at 350 degrees for 20 minutes. Mix cream cheese, whipped topping, confectioners' sugar and vanilla and spread over cookie dough. 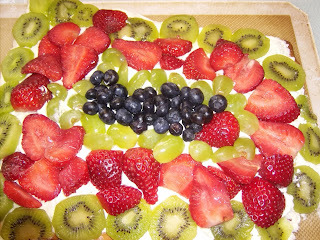 Place fruit on top, beginning at the outside edge, and put a cherry in the middle when finished. Tip: Blueberry pie filling can be used instead of fresh fruit. Ok i joined and added my blog.